The 1000 kg floor weighing scale combines features of digital and mechanical systems to solve challenges of determining the weight of heavy items such as harvested products, feed ingredients prior to milling, finished feed, animals etc as well as grade products into required weights. 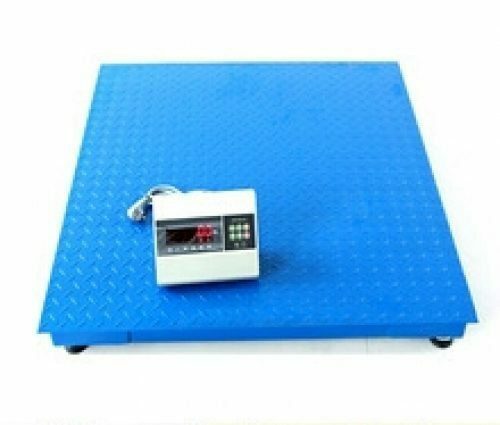 1000kg digital floor weighing scale is an easy to use all-encompassing equipment for demanding weighing operations. It’s sturdy weighing floor scale series provide enhanced performance for a versatile and advanced weighing operation. It is well adapted and suitable for supermarkets/retail stores, feed mills, warehouses, workshops, agricultural market, farms, industries etc. High-speed indicator with digital display panels and alpha-numeric keypad. It features a digital gauge that enables further accuracy and precision in weight measurement. Multiple advanced weighing units with intuitive software. Coated steel base and columns. A sturdy bottom beam to support the weight of the scale and weighed items. Carbon steel reinforced check plate to prevent the goods from slipping off the platform. Newly designed steel weighing platform. Digital indicator (with LED displays). High durability and value for money. Easy to install and operate (special training or learning is not needed). Carbon steel material with 5-6 mm thickness. Easy viewing on indicator | wide 180° viewing angle.